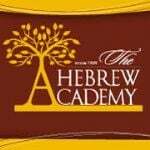 The Hebrew Academy is pleased to announce that beginning next school year we will be adding a 9th grade boy’s high school class and adding a grade level each year until the high school is complete. At our last board meeting, the board gave full approval to the plan that was presented by Rabbi Newman, head of school. The Alevy Family has most generously offered to fund the high school into the future. The gift from the Alevy family to the middle school has allowed the program to grow and thrive and the family has decided to put their support behind the full high school at this time. Our 5th graders and Upper School students had the special opportunity to enjoy a remarkable presentation from professional space engineers and scientists. Our own STREAM Lab Coordinator, Dr. Greer invited these accomplished professionals to teach about space exploration. They explained the historical launch of the first-ever lunar-bound Israeli spacecraft, Beresheet. The spacecraft was launched by SpaceIL, a non-profit Israeli organization, who received the Google Lunar X Prize to land a spacecraft on the Moon. The Hebrew Academy Upper School is showcasing their very own production this coming Sunday, March 17. Come and see an amazing story of faith and how one girl discovered her true self. Set during the Egyptian exile, Nailah is on a journey to find where she really belongs. Come see this amazing story and performance at the Hebrew Academy, Huntington Beach, at 5:00 pm. Can’t wait to see you all there! For women and girls and boys under the age of 9. Each semester the students lead a "Thesis" project from start to finish. This project ties in their learning from our multi-faceted curriculum and school values. The students design the project from concept to plan, then they oversee the implementation and results. This spring, Hebrew Academy students will identify needs in their community, then research non-profit organizations (NGOs) that fulfill those needs. 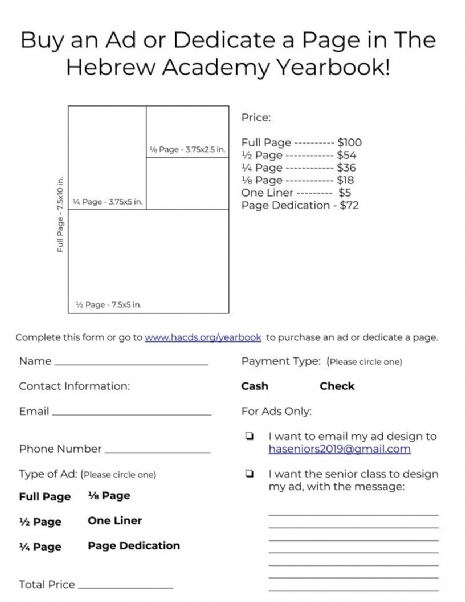 We are now selling ads in our yearbook! Check out the flyers below. Hebrew Academy Middle School Students have been conducting an in-depth, interdisciplinary research project about earthquakes. Their research has included discovering the causes of and patterns of seismic activity. They have also learned the differences between the tectonic activity associated with volcanoes and those associated with earthquakes. The students use the knowledge they have gained through their studies to design a structure and identify what could help their structure stay standing. Students will be presenting their research findings and their structures with a presentation on Dec 13. There are 6 main reasons, according to the Partnership for Excellence in Jewish Education, that are behind most parents motivation to send their kids to day school. They range from education to comfort within the Jewish Community. Each has their place, and each helps affirm why The Hebrew Academy is the best place for our communities children. 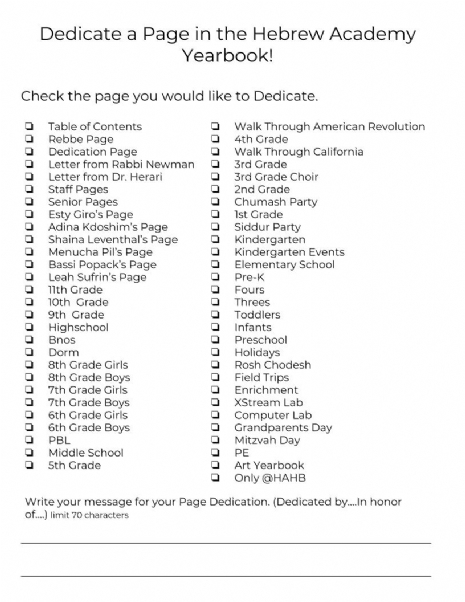 No matter what stage of Jewish life you may walk in, a Jewish Education will not only prepare your child for the real world but will also perpetuate their Jewish Identity and help them see the beauty in our religion and culture. A high school student at Hebrew Academy Orange County's high school was recently honored with winning a local writing contest. Winning the annual Evelyn Linden Baldwin Creative Writing Contest at the Alpert Jewish Community Center (AJCC) was Hebrew Academy Orange County tenth grader, Sima Gollub. 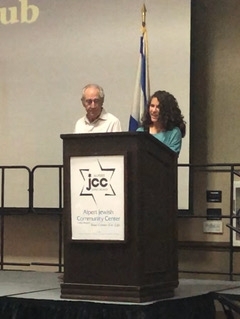 Ms. Gollub had the honor of reading her contest-winning essay at the AJCC’s annual Yom HaShoah event last Sunday. The Theatre Arts Program at Hebrew Academy of Orange County is excited to present this year’s annual high school girls’ performance. The annual performance allows young theater enthusiasts to share their passion for the arts with their peers and the opportunity to perform or work backstage. 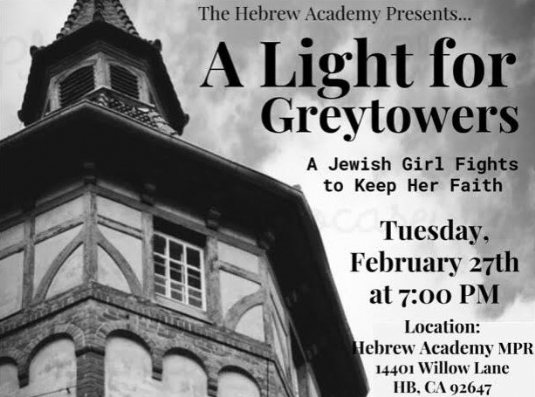 Based on A Light for Greytowers, this year’s performance will be taking place this upcoming Tuesday on February 27th at Hebrew Academy of Orange County (HAOC). The need to defend oneself physically is one that is always useful. That might be said doubly so for women, and especially for young ladies. What if young ladies were trained in a self-defense technique to help them? 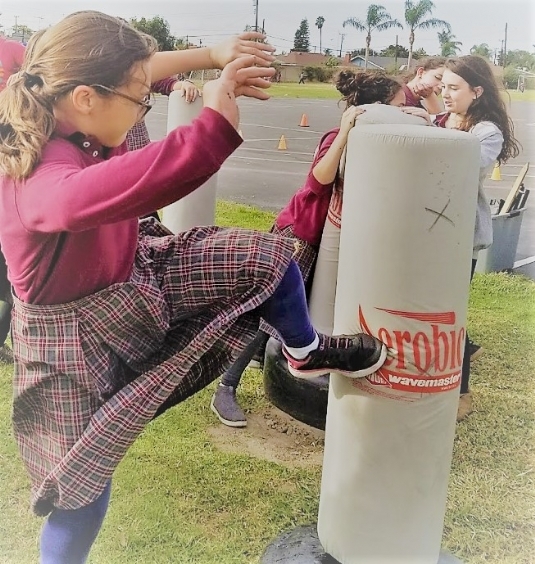 That is precisely what is being done at Hebrew Academy Orange County, where girls in 5th grade through high school are offered a self-defense class. The class utilizes krav maga, contact-combat in Hebrew (קרב מגע), which is a military self-defense and fighting system developed for the Israel Defense Forces (IDF). The class is taught once a week for 45 minutes by Hebrew Academy Orange County’s chief of security, a ten-year veteran of the IDF. This Shabbos we are having our first HAOC Upper School Girls Unity Shabbaton!!! Judaic studies at the Hebrew Academy strengthens and reinforces everything that our students learn all across the curriculum. Moreover, the method in which our students engage in Chumash/ Torah studies in Middle school affords them wonderful opportunities to stretch their thinking and imagination, and the ability to create and construct powerful and inspiring personal life lessons that they can apply to their lives as students today and that will guide and shape their characters long into the future.